On this date* in 1826, five leaders of the Decembrist revolt were hanged at St. Petersburg’s Peter and Paul fortress for their abortive eponymous uprising eight months before. The most renowned and romantic of Russia’s hapless liberals, the Decembrists were a secret clique of idealistic young officers, many of whom had cut their teeth chasing Napoleon’s grande armee out of Russia in 1812. In Russia’s complex interaction with the West — its ideas, its political institutions, its ways of life — these were the westernizers, who saw constitutionalism as the way of the future. 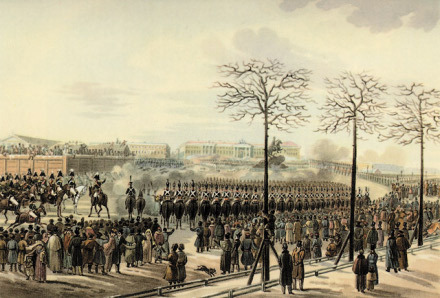 Upon the mysteriously sudden death of Tsar Alexander I, an irregular succession to the second-oldest surviving brother, Nicholas I, gave our day’s doomed and gallant youth cause to occupy St. Petersburg’s Senatskaya Square to uphold the rights of the first brother — and more to the point, to uphold the constitution to the extent of constraining the monarchy. Decembrists at Senate Square, as depicted by Karl Kolman. This badly organized affair failed in its aim to attract the mass of soldiery and, constitutionalists as its organizers were, did not even aim at mobilizing the general populace. After the initial heady rush of marching into the square in the name of liberty, the Decembrists were left in a standoff against a much larger force of loyalists. When the latter started shooting, that was that. Those that survived faced trial, with five — Peter Kakhovsky, Kondraty Ryleyev, Sergei Muravyov-Apostol, Mikhail Bestuzhev-Ryumin and Pavel Pestel — initially sentenced to drawing and quartering. “Mere” hanging was deemed sufficient for the purpose. 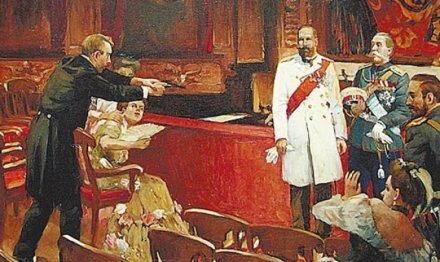 That would be about the maximum embrace of liberalism by the Russian autocracy, whose lesson from the uprising was to crack down against any hint of forward-thinking politics — ultimately an unsuccessful strategy for the Romanov dynasty. St. Petersburg’s Senate Square — renamed Decembrist Square by the Soviet government — where the action happened. 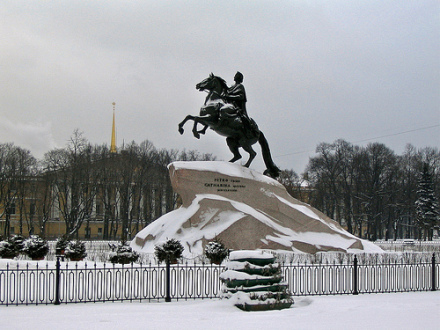 The iconic equestrian statue of Peter the Great, commissioned by Catherine the Great and unveiled in 1782, witnessed it all; the statue acquired its enduring moniker, “The Bronze Horseman”, from a poem of the same title penned in 1833 by Alexander Pushkin, a friend of several Decembrists. He sat, begirt with mist and air. Power and authority He claims! What fire in yonder charger flames! Other Decembrists not condemned to the unreliable craftmanship of the Russian gallows were shipped to Siberia, where they invigorated the cultural life of the Lake Baikal city of Irkutsk — many of them famously followed by their “Decembrists’ wives,” an iconic type that continues to denote heroically sacrificial loyalty since the women had to renounce their own right to return to European Russia. These, at least, had a place to call their own, however distant. But the class of Russian elites to which they belonged would be thrust into a trackless wilderness by their failure (in the Decembrist rising and otherwise) to carve out some distinct place for themselves. Russia’s long reckoning with modernity still had many years to run. 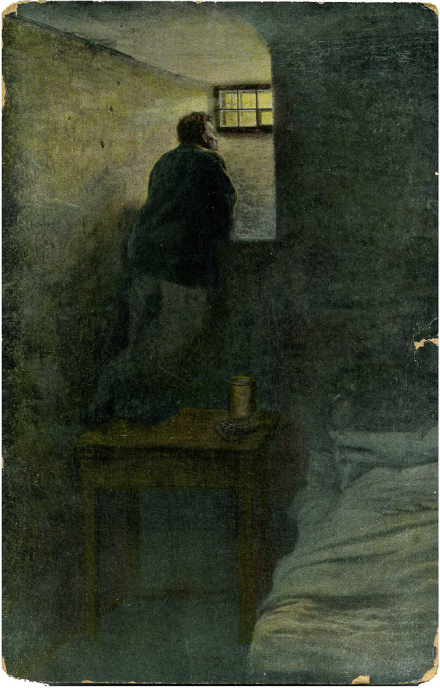 A worn postcard of a 19th century Russian painting depicting (perhaps) a political prisoner in the Peter and Paul Fortress. * July 25 was the date on the Gregorian calendar; per the Julian calendar still in use in Russia at the time, the date was July 13. ** Ryleyev was quite the saucy one, having fought a “mysterious” duel with Pushkin in 1823, and instigated (and served as second at) a famous St. Petersburg jilted-love duel in 1825 that cost the lives of both antagonists. 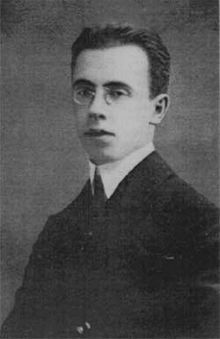 A poet himself and a romantic to the point of fanaticism, Ryleyev wrote odes extolling executed national heroes like Artemy Volynsky and Severyn Nalyvaiko, seemingly alluding (as in this excerpt from the latter work) to his anticipation of joining them.